The message below was received from the Tri-ang Minic group. I received some sad news today that one of my friends has had his 10 ¼” gauge Class 73 locomotive and riding wagon stolen during the last week from the North Kent area. 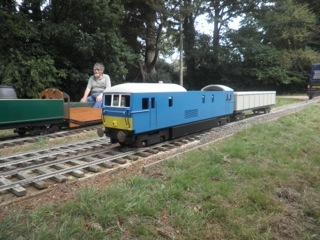 It is very distinctive, being re-built on vintage Tri-ang Minic Narrowgauge Railway bogies, and is fabricated mostly from wood being built by the owner and is one of a kind, see photograph. Its very large and heavy at 6’ long, so one could presume those who took it were specific in knowing what they were taking and given the facility that is required to move it.